Jay Leno’s Garage is a YouTube channel, a TV show, and now a brand of car cleaning products. Turns out the latter are actually pretty good. And one of the folks who helped create them showed me some tricks that even made my 200,000-mile Nissan 300ZX look decent. When I first heard Leno’s logo was being put on cleaning spray bottles, I just assumed some suits somewhere were trying to capitalize on the late night king’s name. Obviously, his name’s attached for a reason, but I’m happy to report that the stuff is actually used and specifically formulated by and for Leno’s personal detailers. 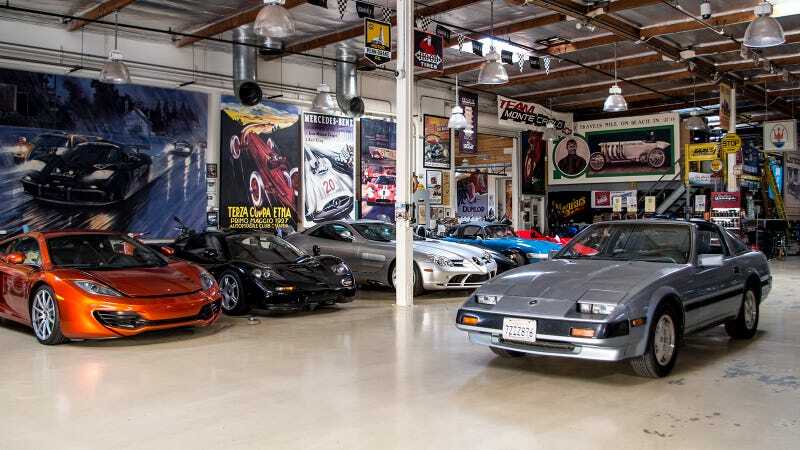 The reason that means something is, as you may already know, Leno’s collection is way more extra than the typical Rich Hollywood Person’s private parking area. The comedian car guy’s facility is thousands of square feet of warehouse space where the walls are covered floor-to-ceiling in beautiful automotive art, and most of the floor space is devoted to cars that are not just valuable, but actually interesting. On a casual walkaround, I saw everything from a McLaren F1 to a Mazda RX-8 Shinka to a mid-engined Ford Festiva to a whole room full of motorcycles I’d never heard of—not to mention steam-powered cars and the cleanest GMC Syclone on Earth. He basically has everything. While I was touring the joint, expert car cleaner and marketing guy Chris Walters was spritzing and scrubbing one of his products onto the brass light housings and fuel cap of a Fiat from the early 1900s. Walters, one of the main men behind the Jay Leno’s Garage Advanced Vehicle Care products, as they’re called, explained that he was part of a chemical company which supplied some of the cleaning products used by Leno’s staff (apparently “nine or ten” people work at the garage) on the precious collection. When Leno’s personal detailer left, Walters and company established a direct relationship with Leno himself and basically began supplying Jay Leno’s Garage with its own specific kind of car care chemicals. Now that “Jay Leno’s Garage” is sort of a known brand, a deal was inked to sell this stuff to the public. Right now you can only get it on lenosgarage.com, by the way. Leno himself officially owns the company, and yes, the stuff is used on his massive and valuable car collection. Neat. But is it any good? I trusted them with my own priceless ride to find out. Okay, my 1984 Nissan 300ZX isn’t exactly priceless, but it is fragile and covered in grossness that’s older than I am. Walters demoed the Leno-branded All-Purpose Cleaner ($9.99 for a 16-ounce squirt bottle) on a few distinctly different parts of the car so we could see for ourselves how well the stuff works. He busted out his bottle of neon green All-Purpose Cleaner and hosed the speckles of blackness with about three squirts of the stuff, wasted no time to scrub it with what looked like a toothbrush with extra hard bristles (try to go with the grain of the fabric pattern), did a few dabs with a microfiber rag, then interestingly did a key-turning motion with a clean part of the same rag. Now that I’d never seen before. “This is to pull the grease and grossness out of the fabric, rather than spread it around,” he said. Indeed, it worked brilliantly. Seconds later, the seat looked mint. Actually, a little too mint in the small quadrant he’d just cleaned. “We do have a fabric cleaning product that would work on the whole seat,” he added. If you spot-clean a piece of cloth that has 30 years of age on it, you’re going to want to clean the rest of the thing to really make it look good. But for the time being, I was impressed at how quickly and completely this green stuff killed the stain. I was really hoping to get an engine bay cleaning demonstration, since the under-hood area of the 300ZX is a horror show and I’ve been too lazy to tackle the project myself so far. But Walters was intimidated, too. “There are a lot of exposed wires under here,” he said ominously, explaining that we were looking at a multi-hour project. You need to be careful cleaning the engine of any car, since water and electronics don’t really mix. The task becomes especially precarious when the car’s old, and even a light squirting can damage tenuous connections. So we truncated a full engine cleaning to just shining up the red intake cover piece, which had most certainly not been cleaned since 1984. That same green stuff we used on the seat turned it into blingy beacon of red-accented coolness at the center of that tired old three-liter V6. Now I really am inspired to clean the rest of the engine bay, not to mention very genuinely impressed with the versatility of that All-Purpose Cleaner. All Walters did with it here was drench the engine cover, scrub it with what looked like a bathtub tool, dried it with a microfiber towel, and repeated the process once. 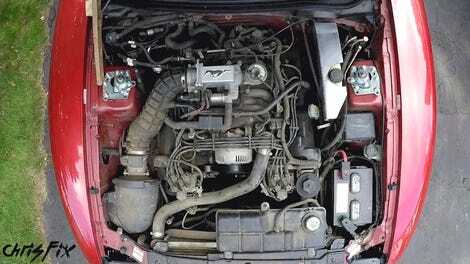 Imagine how fresh this engine would look if I went through the whole thing like this? Back inside the car, the green spray bottle had one more trick to show us: removing decades of hand-filth off the rubber shift knob. Laying down a bib of microfiber around the knob, Walters doused the thing and let the chemical sit for half a minute or so. Then he attacked the caked palm grease with that tough toothbrush from the seat job, slowly but deliberately chipping away at the nastiness that had changed the knob’s color and obscured the shift pattern for who knows how long. After three rounds of this the thing looked, well, maybe not new but at least 20 years fresher. And hey, you can tell it’s a five-speed now! This same technique worked on the hand brake grip, and even a strange grease stain on the seat belt. Seat belts are always scary to clean, because the idea of caustic cleaning chemicals quietly eating away at the belt’s fiber freaks me out. Peace of mind here is a solid advantage of the gentle Leno stuff. Since we had to find something you couldn’t clean with the All-Purpose stuff, I asked Walters about something I’d been afraid to do forever: cleaning the covering of a gauge cluster. This is usually made of a plastic or polycarbonate, not glass, and can scratch or become cloudy extremely easily with the wrong tool. Walters told me that regular glass cleaner works just fine on it, though. Success here is more about using the right type of towel. We should have taken another pass to get rid of the spots, but at least the grime went away. While a terry cloth or paper towel could tear it up, a very “tall” microfiber that you turn a lot is ideal. In this context, “tall” means that the little strands of softness protruding from it are long. Naturally, you can order these along with all the other chemicals on the Leno’s Garage site. As to whether the Jay Leno’s Garage Advanced Vehicle Care products are actually superior to other stuff on the market, I have to confess I can’t tell you. But I was pleased to see that Leno’s cleaning products have legitimate credentials and actually work, and that you can safely squirt it pretty much anywhere from your engine bay to your seat fabric without risking hurting anything. Neat!